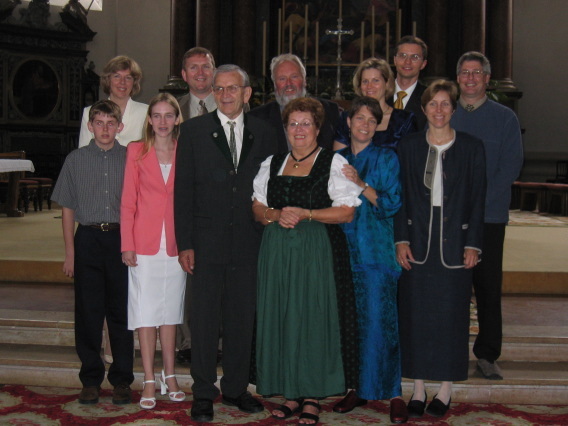 June 27, 2003: Charles and Charlotte's 50th wedding anniversary in Salzburg, Austria. Left to right (sort of): Ryan, Peggie, Rachel, Michael, Charlie, Gerhard, Charlotte, Marianne, Kathi, Rainer, Linda, Gary. So far, there are five pages in the Family History collection. The organization of these photos will evolve over time. Feel free to email me any pictures you want included, or mail them to me in ordinary post office mail and I can scan them and put them up. Please let me know if you know the dates for any of these pictures. Solipsistic: a theory holding that the self can know nothing but its own modifications and that the self is the only existent thing.